Please connect to your sincere heart say these two prayers 3 times to yourself or alloud. to create a world with true and grand harmony"
The Ho'opono pono Prayer is a powerful hawaiian healing prayer for reconciliation. THE SECRET LIFE OF WATER VIDEO - Please enjoy this visual sound-scaped water journey into the Secret Life of Water together with Masaru Emoto's Messages from Water. This guided meditation is purposed to raise the conscious awareness of water, and is dedicated to the Life & Love of Masaru Emoto for opening the world's minds and hearts together though water. Water is what connects us all. We are Water. When you download MY HADO App you are supporting Masaru Emoto's Peace Project.~ Individually we are on drop ~ Together we are an ocean. A Monthly Water Ceremony Of Love & Gratitude with Native American Elder & Medicine Man Iron Eagle Joe. We are very fortunate to have Iron Eagle Joe leading a monthly Water Ceremony in Jupiter Florida, sharing wisdom from of the heart and his dedication towards educating all people the importance of WATER. We invite you and your family to join monthly Water Ceremony of Love & Gratitude, a gathering of the heart, with true intention to heal our Waters for Peace on Earth. We are water and water is Life! Water is what connects all life. When we set our hearts intentions to love and gratitude to heal water, we heal ourselves and we heal all water life on Mother Earth. When we gather as a community and unite hearts in Love & Gratitude, it's the power of our resoance that will forever shift consciousness towards a greater awareness of WATER and the power each of us holds for Peace on Earth. Peace begins within. 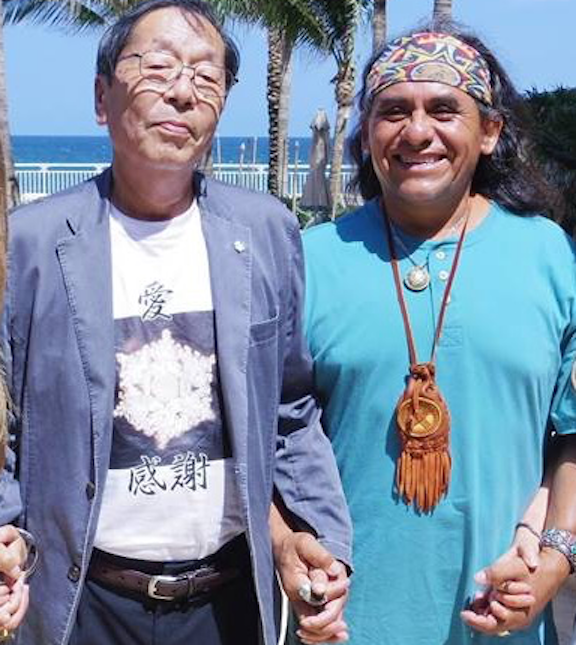 When we brought Dr. Emoto & Iron Eagle together in 2014 to hold Water Ceremony in South Florida, they shared an instant brotherly connection of the heart and a great respect for WATER. Dr. Emoto held a private meeting, where with great honor, he invited Iron Eagle to Japan to participate in the very sacred Water Ceremony held every 5 years at the Heitate Shrine for World Peace. Even though Dr. Emoto sadly passed away suddenly, only two months later, Iron Eagle Joe honored Dr. Emoto's request to travel to Japan to participate in blessing our water for world peace. Iron Eagle Joe is a consistent blessing and resource in the community of South Florida and abroad in helping families and facilitating healing for the people in need. With humbleness and great integrity, Iron Eagle leads by example, teaching others the importance of intention solely from the heart. When our intention into every moment comes from love and gratitude, we are open to the power of the resoance of Love and Gratitude making healing for all life (water) possible. We would like to share our deep Gratitude to Iron Eagle Joe & Richard Wyzanski for facillatiting Water Education & Monthly Water Ceremony for the South Florida Communiy. 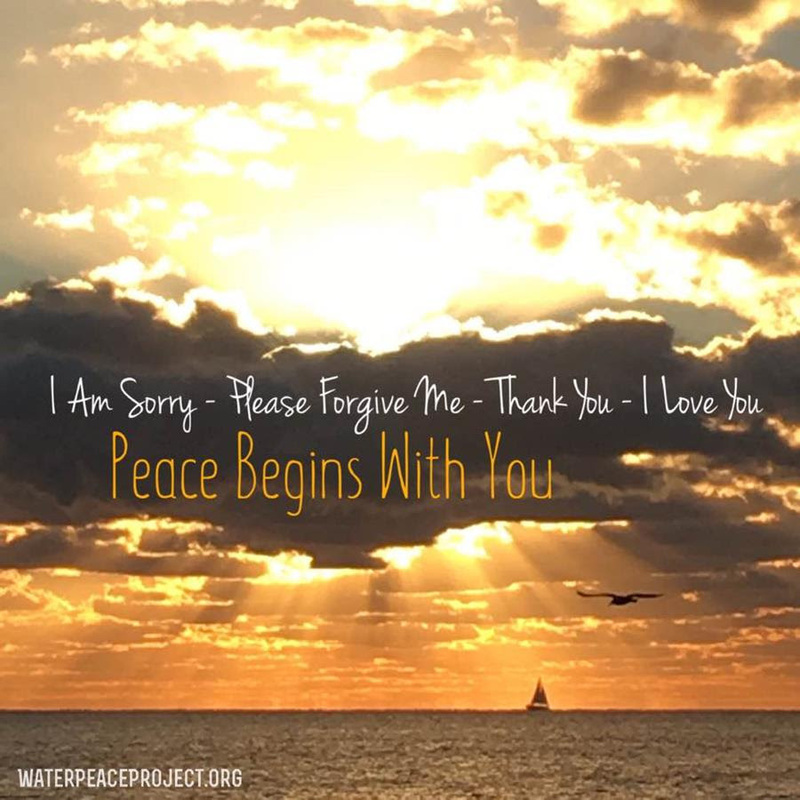 It has been through their resonance and support that Water Peace Project is able to continue spreading Love & Gratitude to this wonderful South Florida community! Everyone Is Welcome to Join Our Monthly Water Ceremomy in person or in heart right from where you are. Please join this event, share with friends and check back each month for Monthly Ceremony Locations, Special Updates & Honorary Guests! DETAILS: Enter into park passing soccer fields until the end of the parking lot where we will be gathering on the beach right at the inlet water's edge. Feel free to bring a blanket or chair to sit on if needed along with WATER to keep hydrated. COST: There is no cost for attending this Water Ceremony. It is free and open for everyone to join together for the purpose of Peace through Payer To WATER. We thank you for your resonance in Love & Gratitude.